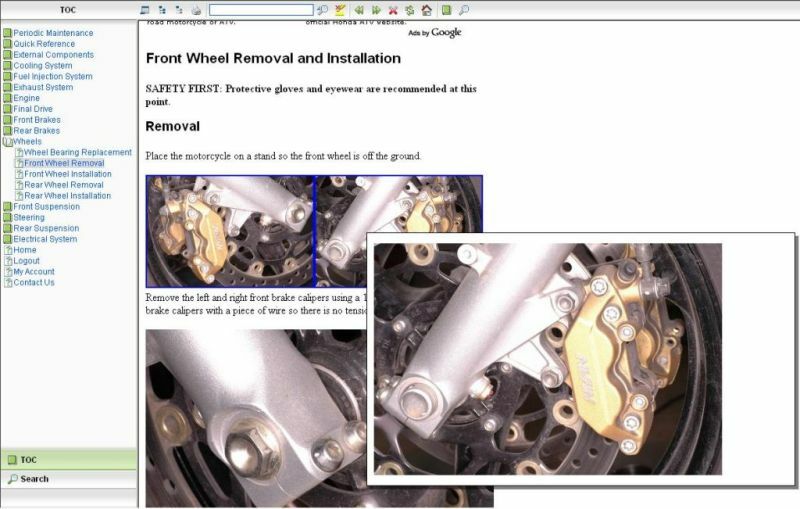 I came across the Cyclepedia web site and was offered a peek of their recently released 2003 - 2006 CBR600RR on-line manual for review. 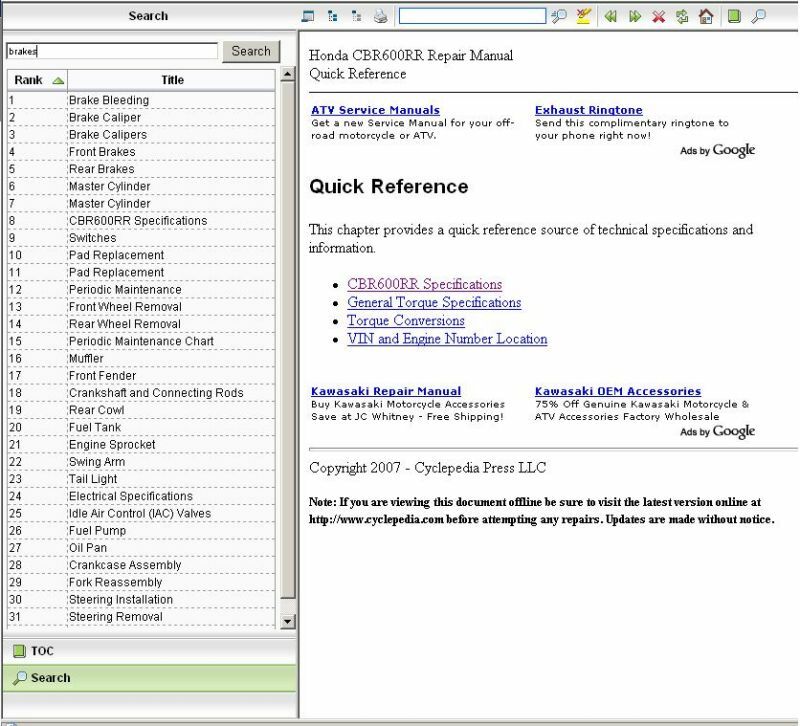 What is the Cyclepedia on-line manual? It's a privately written, photographed, assembled, and published (on the web), repair manual, an alternate to the OEM Honda manual. Sitting down with both the on-line manual and the OEM Honda service manual, I proceeded look through most sections, some more in depth than others. Display is set up in format similar to a adobe pdf run inside a web browser, so the layout and tools have a familiarity about them. 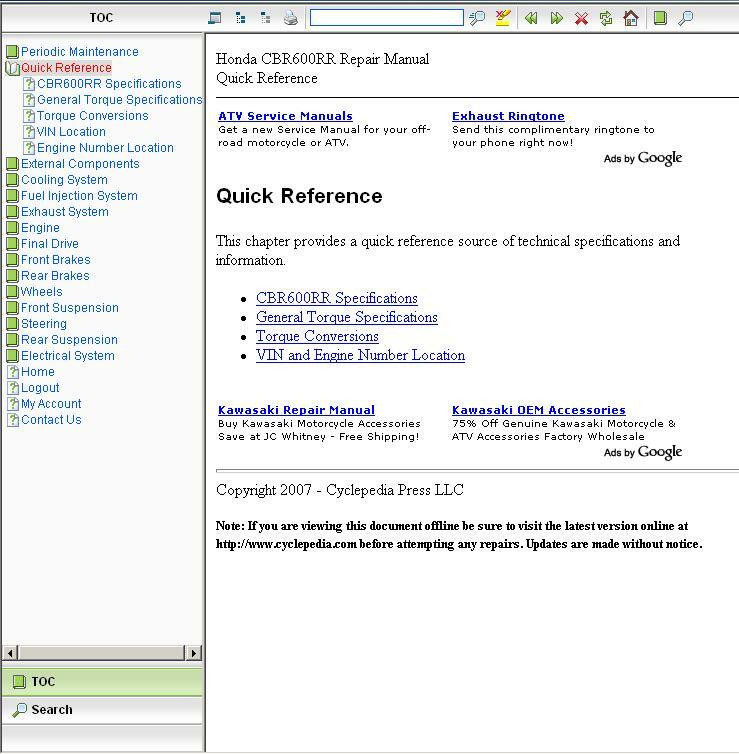 Navigation of the on-line manual is extremely straight forward, understandable, and easy to use. It's displayed on the left side via a table of contents (TOC) expanding folder system. Simply click on the relevent folder to expand it, then choose the item of interest from the TOC or the main page to display the relevent content. If you don't know exactly what your looking for there is a search function that is easy to use. - The Good: The manual is well written, clear and easy to follow, there are even a number of helpful tips and tricks. Full color photos with captions really clarify each process. The majority of the photos can be clicked on and enlarged for a better view. This manual is much easier to follow, inturn making the task(s) at hand easier to perform. What really is remarkable is that they have just started creating these manuals as of last year (2006), and have assembled a staff that really knows how to make taking your motorcycle apart bolt by bolt, seam like an easy task! - The Bad: There really isn't much I can really say bad about this. The only real down side I found was that, while small, the differences between the first generation - 2003/2004 and second generation - 2005/2006 CBR600RR, this manual only shows the details on the first gen and states that the second gen procedure is similar. While yes they are similar but I feel the differences need to be shown more in depth. I feel the enlarged "pop-up" photos could be bigger. If you are looking to learn about your bike, do maintenance (from basic to high level) this manual is absolutely a worthwile purchase. It's more geared to the everyday rider than the trained mechanic. Unless you are doing a total teardown of every nut &amp; bolt this manual is more than you need,even if you are doing a complete nut &amp; bolt teardown this manual is a great addition to teh factory manual. The factory service manual is much dryer and harder to follow by comparison. That makes the cost of this manual a steal compared to the factory one. nice writeup. definetnly something to look into for those that need better explanations than the factory service manuals. good find. Personally, I use the Clymer CBR600RR manual for my 2004 (the manual covers 2003-2006 models). It's very easy to use. Definitely written for the do-it-yourselfer. It's got everything from simple maintenance and lubrication to complete engine rebuilding. There are also color wiring diagrams and all the check engine codes are covered. I've used factory manuals in the past and this Clymer manual is so much better...and cheaper. I have concerns when it comes to online manuals. The first is, I don't have a computer in my garage and am not planning on getting a second one toset upout there (and even if I did I'd be afraid it wouldn't hold up good...my garage isn't temperature controlled so it gets cold and hot...and I'm not even considering the dust and dirt and grease...a computer in the home garage just doesn't sound like a good or cost-effective idea to me). My Clymer manual definitely has finger prints and smudges in it, but it's holding up fine. So, if I used an online manual I'd have to print each page I needed or I'd have to run between my garage and living room for each step. I also make tons of notes in my manuals. I record everything from my maintenance log to little tips and tricks my friends have shared with me. Can I do that with these online manuals? I don't know. I've also packed up my manual and taken it with me to track days. No way is an online manual going with me to the track...or on any road trip with my buddies. Just my 2 cents (or more like 3 after reading this and seeing how long it is). If you really have concerns give it a try, that will either confirm themor blow the doors off them. Frankly until you do so; neither criticism nor praise has any merit, it's only speculation. Honestly I've owned, used, and destroyedClymer, Haynes, Online manuals, evenfactory manuals for a large number of bikes, cars &amp; trucks. Each has its plus's and minus's, because each individual user will react / learn from it differently. This is just another option. I tried posting this a week or so ago and my newbieness is really showing through because somehow I didn't get it to post. 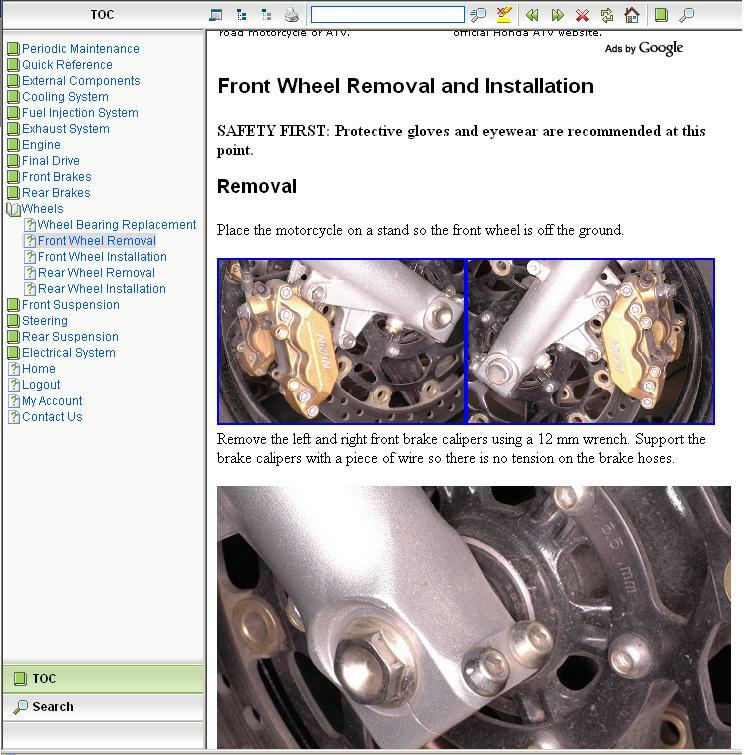 Just wanted to point out that a buddy of mine bought the cyclepedia online manual. All was good until he was taking apart his clutch, got it apart and then couldn't get it back together. He called me wanting some help. My Clymer had detailed, exploded views that had all the parts listed and their order and orientation. I was kinda shocked the cyclepedia didn't have good parts views. Every manual I've ever used has these. And anyone that has used a manual from anyone (Clymer, Haynes, the OEM) knows that the pictures don't always show what you need. I use those parts diagrams all the time. Plus, they make ordering parts from teh dealer easier because you can use them whn looking at thier parts diagrams. Yes, sometimes the names don't match exactly, but it sure makes things easier. whats the diff. between a repair manual and a service manual?